San Antonio Divorce Lawyer - Bexar County Family Law Attorney - The Law Offices of Allan R. Manka, P.C. The Law Offices of Allan R. Manka, P.C., is based in San Antonio and represents clients in family law matters throughout the state of Texas. San Antonio divorce lawyer Allan Manka is almost exclusively dedicated to family law matters, and our team of legal professionals has the experience, skills and in-depth knowledge to help you and your family reach the best possible outcome. 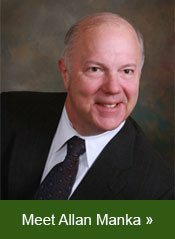 Led by an Experienced and Recognized Family Law AttorneyNearly 40 years ago, our principal attorney began his legal career assisting people. He has gained the knowledge, insight and experience necessary to help his clients with their particular needs. San Antonio divorce attorney Allan Manka is a veteran in the courtroom and understands the importance of preparing a thorough and persuasive argument, and he will stand up for your best interests. Coupled with compassion and integrity, the services at our firm include the highest level of professionalism. What to Expect At Our Law FirmWhen you retain services from a San Antonio family attorney at our law firm, we will sit down with you personally so we can establish your goals. This means we want to know what matters most to you and what outcome you would like to achieve. We will present different solutions to you and inform you of the benefits and drawbacks of pursuing each. Having an experienced San Antonio divorce lawyer to help you with your legal matters and questions can make all the difference in resolving the problem effectively and at the right price. We are here as your personal advocate. Contact a Bexar County Divorce Attorney TodayWe invite you to contact a family law attorney from our firm at 210-807-8629 or toll free at 866-621-7085 to schedule a free initial consultation.